Our payroll system offers many features that can cater to the special payroll processing needs of Electricians and Plumbers. Payroll Mate® you can gain helpful insight to your payroll with the ability to pull over a dozen payroll reports. With this system you can pay full-time / part-time, hourly / salary and W2 / 1099 employees. Run payroll for your plumber or electrician small business in-house using desktop-based software. Track union dues, healthcare benefits and other payroll deductions. For $119 only, process payroll for up to 10 companies with up to 75 employees per company for one calendar year. If you are an electrician or plumber, you may not have a lot of time to dedicate to processing payroll. Instead of hiring an accountant or full-time bookkeeper, why not turn to a convenient software that can assist you with your payroll? With Payroll Mate®, you can concentrate on running your company, completing jobs, and still have time to process your payroll. Here are a few reasons why you should check out Payroll Mate®. 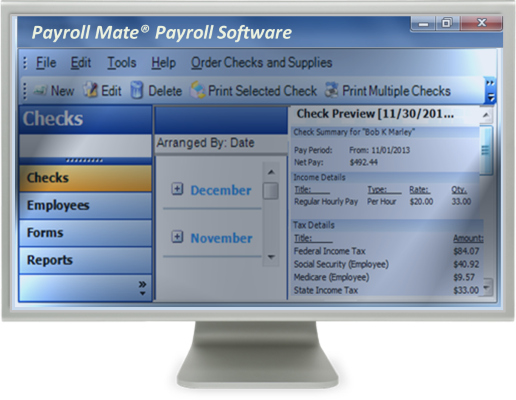 • Payroll Mate® accurately calculates State and Federal withholdings, Social Security, Medicare, and the net pay. • You have the ability to custom create unlimited user defined tax, income, and deduction categories so you can ensure you can fulfill payroll for any type of employee. Is your state not listed? You can simply pull a State Taxes report which will provide you with your figures so you can manually fill out your state forms. • Reports are easily accessible and provide you with all of the necessary information that pertains to your payroll. Some reports include Tax Liability, Journal Summary, Deposit Requirement, Taxes & Deductions, Employee Earnings, and many more. • When dealing with tech support issues for most programs, you may face an uphill battle just to figure out a solution to your basic problem. Payroll Mate® provides you with multiple types of assistance that is always available in one way or the other. Built in tutorials are included which are very detailed and go over many aspects of the program. These are available at any time inside the software. Step-by-step wizards are also including so setting up Payroll Mate® is as easy as possible. Need further assistance? Support is also available by live chat, phone, and email. • With one click of the button, you can backup your payroll data to an external drive. • You will be prompted to backup data each time you close out of the program to ensure you always have an accessible backup if needed. • Lost your data? Simply restore your backup. This is done in a few simple steps. Signature ready checks can be printed on Payroll Mate® compatible checks which will include your company’s name and bank information. This way, you will not need to worry about printing compatibility. Do you want to print onto blank check stock? An additional cost add-on feature to Payroll Mate® will allow you to do this. Simply enter in your bank information and print onto blank check stock. • Pay stubs are conveniently printed so your employee’s can keep these for their records. Social Security numbers can be easily masked on these printed pay stubs. • Vacation and sick time can be easily tracked and these balances can be printed on the pay stubs. As you can see, Payroll Mate® can provide you with many useful tools that can make handling payroll easier and more time effective. With Payroll Mate®, you can concentrate on bringing in new clients and fulfilling jobs while still having time to process your payroll.